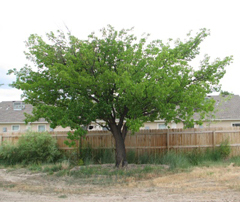 This tree in Colorado Apricots are currently growing in communities over 6,500 elevation. Hardiness Zones 4 to 9. Growth habit Height to 20 feet with a spread of up to 25 feet. If left alone in a full sun environment the tree will develop a wide crown. Foliage Ovate-shaped leaves that are kelly green in color with finely serrated leaf margins. Leaf color yellow to orange-red in the fall. 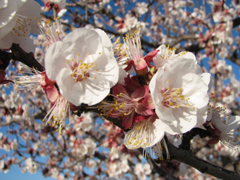 Flowers First to bloom in the spring before other traditional fruit trees (e.g., apple, cherry, peach, pear, plum) . Flowers up to one-inch across usually white. Trees are usually self-fertile and do not require a pollinator. Fruit Fruit is round up to 2 inches. Color varies from yellow to orange. Due to tree’s early blooming characteristics and potential for blossom killing frosts, annual fruit crops are spotty. Bark Gray and slightly furrowed. Twigs Young twigs are reddish brown and rough. 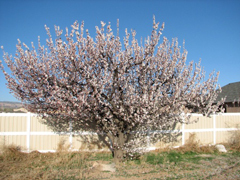 Insects and diseases Pests in Colorado include all those that usually affect stone fruits; peach tree borer and Cytospora fungus canker. Aphids can be a nuisance when populations explode. 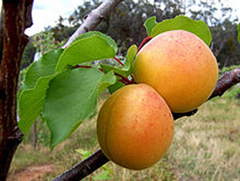 Cultivars Apricot selections for Colorado take advantage of later blossom characteristics and cold hardiness. Some examples that may be available include: Moorpark, moongold, scout, and sungold. Landscape value Apricots are traditionally grown for their fruit, but crops are not consistently produced in most settings. 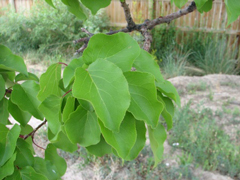 The tree has desirable characteristics that warrant planting it in Colorado landscapes. Blossoms are prolific and showy. Foliage is clean and attractive. Fall leaf color is yellow to orange-red. Interesting features This tree has a long colorful history of cultivation by humans. 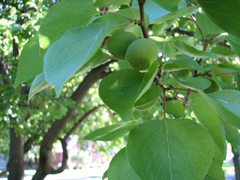 Part of its scientific name comes from the fact that it was growing in Armenia and area just east of present day Turkey. Because of its popularity the tree moved quickly around Asia and Europe with explorers and armies. It has thrived in the Mediterranean climates of Europe, Asia, and the Americas.